Why are you never on time? If you’ve reached here in time, then we had not missed the beginning of the movie. She likes to get up in time, to do all the routine activities and reach the office on time. I hope you get home in time, to watch your favourite show on time. What will you do, if you are not there in time, and the event started on time? 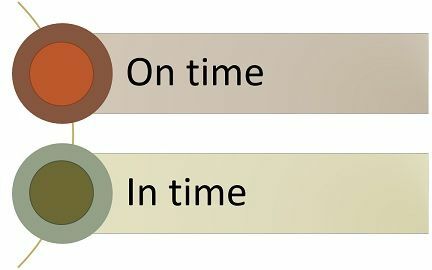 In these two examples, we’ve used the word on time to refer something that happens on a particular time, whereas the word in time is used to mean without being late or not later than the desired time. Meaning On time means timely, i.e. when something is planned or expected to take place at a specified time and it takes place accordingly. In time means not late or eventually, i.e. when something takes place at the last moment. Examples Alex is the only employee in this office, who is always on time. The child wants to get home in time, to watch his favorite cartoon. She arrived at the exam hall on time. Will she reach there in time? Maybe the train left on time, and we are late. She may feel comfortable in time. If I leave now, I will reach there on time. Joe asked if the flight was on time? I don’t think Kate will complete the project on time. From tomorrow, all the employees have to be on time, or else their salaries will be deducted. The interview started on time. The seminar is fixed at 4 pm; Please reach on time. She arrived just in time for the class. I want to reach home in time, to meet the guests. Will you complete the homework in time? The construction of the building is completed in time for the inauguration. We got to the stadium just in time, to watch the cricket match. When something takes place at the expected or established time, i.e. it is done according to the schedule, we use the word ‘on time’. On the other hand, ‘in time’ is used to denote soon enough, i.e. just before the end moment or before the expiry of the set time. The term ‘on-time’ represents punctuality, i.e. at the predefined or correct time. As against, ‘in time’ is an indicator of tardiness (the sense of being late). On time is commonly used with obligations and duties. When you have to report or reach somewhere in the desired time, we use the word ‘on time’. Conversely, in time is used primarily with deadlines, in the sense that when you have to complete something within a particular time frame, we use ‘in time’. The opposite of the word ‘on time’ is late, whereas the opposite of ‘in time’ is ‘too late’. We left for the airport on time. I will reach the restaurant at 12 pm; please be on time. Don’t worry we’ll reach the hospital on time. The flight was late today. However, it’s usually on time. Joseph set the alarm, to wake up in time, to study for exams. The trimmer didn’t seem to be delivered in time, with the other stuff ordered online. We are sure that Joseph will finish the work in time. Kate almost forgot to deliver the parcel. Luckily, she remembered in time. With the above discussion, it may be clear to you that we use the word ‘on time’ for something that takes place on the scheduled time, but we use ‘in time’ for something that takes place in the final time, i.e. doing something before the time is over or something becomes unavailable.